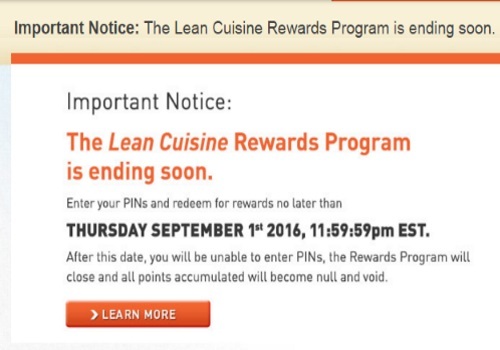 Originally posted March 3 - Some unfortunate news today, Stouffers/Lean Cuisine announced that their Lean Cuisine Rewards Program will be ending! If you collect PIN codes and redeem for rewards you need to do so no later than Thursday, September 1, 2016. After that date, the Rewards Programs will close and all points accumulated will become null and void. I have been redeeming Shoppers Drug Mart gift cards from this program for years actually I just redeemed for another a few days ago! It's sad to see it go but at least we got a lot of warning!